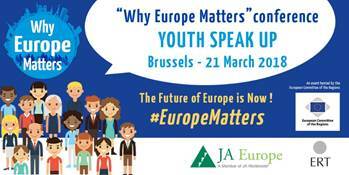 Why Europe Matters is an initiative by JA Europe and the European Round Table of Industrialists to re-engage Europe’s youth in a multinational debate with politicians and business leaders. On March 21, the “Why Europe Matters: Youth Speak Up” Conference will present the outcomes from a pan-European survey of young people, exploring their views about Europe and the EU. Young Europeans from 9 Member States where JA Europe operates will share and present their innovative ideas for the future of Europe to a jury composed of policy-makers and business representatives. The focus will be on bringing concrete contributions into the wider policy debate in Europe.